April is Membership Month! Renew your Membership or become a Member today! It’s Membership Month and we need your support! CAGJ is funded by the community: 85% of our funding comes directly from our Members. Please consider renewing your Membership or become a Member today! Together, we are funding a vital movement to transform unjust trade and agricultural policies and practices while creating and supporting alternatives that embody social justice, sustainability, diversity and grassroots democracy. 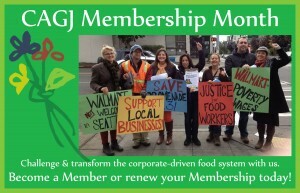 Throughout April Membership Month, we have been featuring supporters of CAGJ. What do you love about CAGJ? Take a moment and let us know! The world will not become a better place on its own. We need to take responsibility to hold corporations, governments and other institutions accountable to the principles that we hold so dearly. CAGJ is poised and ready to tackle some of the hardest issues of our time. Can we count on you to help us build a better future by donating today? Posted in Agra Watch Blog Posts, Agra Watch News, Events, Food Justice Blog Posts, News, Trade Justice Blog Posts.